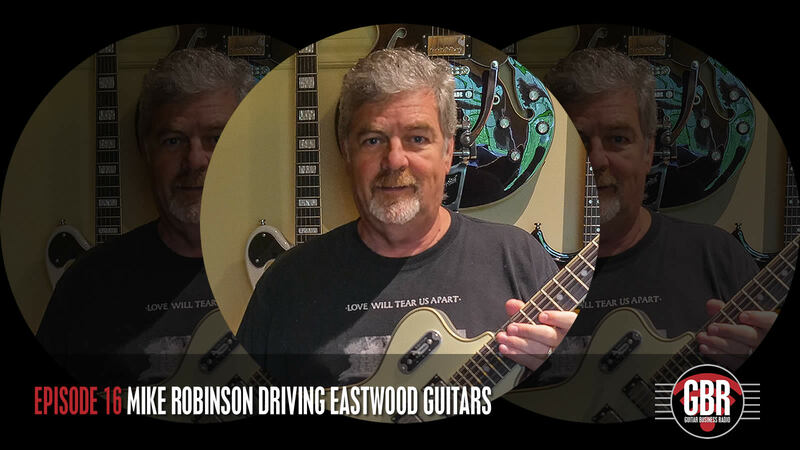 Newport Beach, CA – May 29, 2018 – (GuitarPR) – Guitar Business Media announced that its Guitar Business Radio (GBR) podcast continues to advance audience growth and recognition with the release of Episode 16 – Mike Robinson Driving Eastwood Guitars. From CEO’s to well-known guitar players, GBR is attracting high-caliber guests on the show who share in great detail the successes, challenges, and the twists and turns of their guitar-related business or career. The promotional material famously proclaims that the show regularly offers “No reviews, No Demos and No idle chatter.” GBR is about the business of guitar from all angles, tightly produced and to the point. In Episode 16, host Jeffrey D Brown welcomes Eastwood Guitars CEO, Mike Robinson, to the show. The exclusive interview offers a unique, backstory view of the company’s development, growth and innovative approach to the marketing and manufacturing of their line of tribute and replica guitars. Now, with over 250 guitar models to choose from, Eastwood has grown into a multi-line business featuring a large number of original design instruments as well. In addition, their custom shop is built around a creative crowdfunding model that is unprecedented in the business. GBR is the only dedicated guitar business media outlet of its kind offering serious, high-quality content that you won’t get anywhere else. The weekly show is available on iTunes/Apple Podcasts, Stitcher and Google Play Music and the show’s website. For more information or to listen to the show, simply search for Guitar Business Radio or visit the website at https://guitarbusinessradio.com.